Or at least a strong desire for delicious food, quaffable beverages and top notch hospitality. We aim to combine tradition with creativity when crafting our pizzas using only the freshest and finest ingredients, locally-sourced when in season, and house made dough that is hand-stretched and fired to order in our wood-burning oven. All pizzas are sized at 12 inches, perfect for sharing. Or crush the whole pie by yourself, we don’t judge. At this time, to-go orders may be placed in person. It’s important that we get restaurant operations dialed in. We’ll be sure to let you know when we offer phone orders. Sign up for our mailing list, so you don’t miss the announcement! All Pizzas Can Be Vegetarian/Vegan Modified. Do you have a passion for bringing people and food together? Do you enjoy sharing your love for libations and pizza? Would you describe yourself as charming, confident, captivating and professional? Does creating unrivaled culinary experiences inspire you? If so, we may be that one restaurant you’ve been searching for! We are dedicated to raising the bar and providing an amazing hospitality experience for our guests. Spark Pizza is accepting applications for front of house and back of house staff. Please fill out an application and SEND to Tony and Carolyn Scott. We look forward to meeting you! Will you have a gluten-free pizza? Is it safe for celiac? WE ARE GLUTEN FRIENDLY, BUT PLEASE NOTE THIS IMPORTANT WARNING! We offer gluten-free menu items that are prepared with care, but cannot guarantee 100% gluten-free products or environment due to flour in the air and a non-dedicated oven. People with severe allergies to wheat flour are warned that flour circulates throughout the restaurant and could potentially contaminate any food or be on any surface within the restaurant. We want our guests to be SAFE! Will you have a vegan pizza? Yes, we will have a tangy, meltable vegan cheese & Impossible Burger "sausage" using the same house-seasonings as our meat sausage. In addition to street parking and paid/unpaid lots, there are a few spots behind the restaurant. (Warning: If you drive in and there is no parking, it’s hard to drive out. Consider sending a scout.) We are confident our pizza is so good, it’s worth walking uphill, both ways - in a blizzard ... or at least a couple of blocks. We do not take reservations. If you are a large party, please arrive as early as possible. Please feel free to call ahead and see if there is a waitlist you can be added to. We will text you when your table is ready! After three years of success with their first restaurant, Woodblock, Tony and Carolyn Scott opened Spark Pizza. The two have lived and been very active in the Redmond community for 20 years. They met years ago while working at the Painted Table in Seattle and it was during this time that they first gained a deep understanding of hospitality. Noticing the need for a high quality, wood-fired pizza option in Redmond, Tony convinced Carolyn to open Spark, a casual spot with exceptional food, beer, wine, and cocktails on tap, outdoor seating, plus a friendly staff. Born in Cambodia and raised in Washington state, Savuthy “T” Dy began his culinary experience at a young age cooking with his mother, intently watching her every move in the kitchen as she created traditional Cambodian dishes. Encouraged by his parents to pursue finance after college, T became an accountant, but finally rebelled and chose the cooking route instead. After California Culinary Academy (San Francisco), T interned at Washington state’s only five-star restaurant, The Herbfarm in Woodinville. From there, T accepted a position working closely with Chef Lisa Nakamura, as Sous Chef at Qube Restaurant in Seattle. Nakamura encouraged T to pursue an Executive Sous Chef position in Asti, Italy. This experience gave T a deeper understanding of the subtle nuances of Italian food and cooking, which he has brought with him to Spark Pizza. T connected with Tony and Carolyn Scott, joining Woodblock as Executive Chef in March 2016 after adding to his resume Seattle restaurants: Urbane, The Book Bindery and Ethan Stowell’s Rione XIII and Culinary Director at Tacolicious in San Francisco. Thankfully his family pulled him back to Seattle. 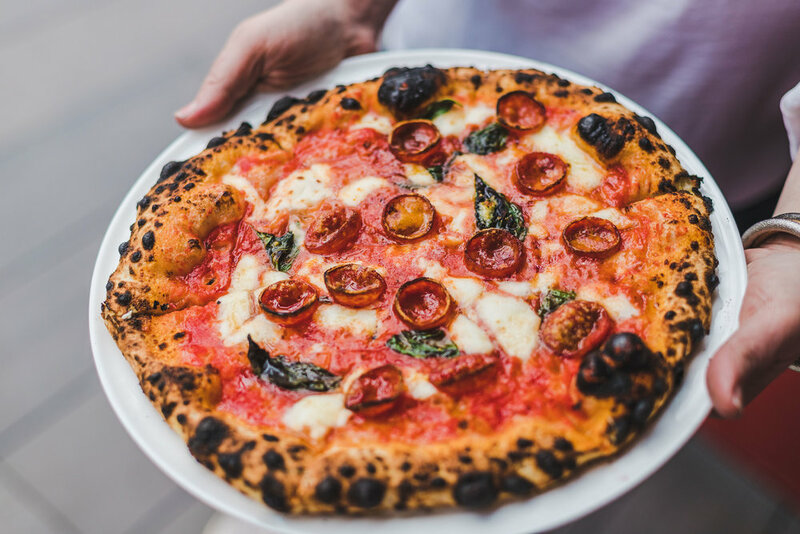 In late 2017, the Scotts had the idea to open a wood-fired pizza restaurant and T gladly accompanied them to New York, Rome and Naples on a quest to perfect their own pies at Spark Pizza. T also acted as translator. A Seattle native, Kyle Cole began his culinary career right out of high school helping to open the Garden Café & Wine Bar at Molbak’s in Woodinville. Kyle continued to hone his craft at some of the city’s top restaurants, including: Canlis, RN74 Purple Café & Wine Bar, The Book Bindery and Copine. It was during his time at Tutta Bella that Kyle fell in love with wood-fired pizza making, developed a passion for his craft. After taking some time off to be a stay-at-home Dad to his two boys and new twin daughters, Kyle joined Spark Pizza as Chef de Cuisine in early 2019, where he and Chef T – whom he met at Book Bindery - have been perfecting the restaurant’s selection of wood-fired oven pizzas that are fresh, perfectly balanced, and truly inspired.